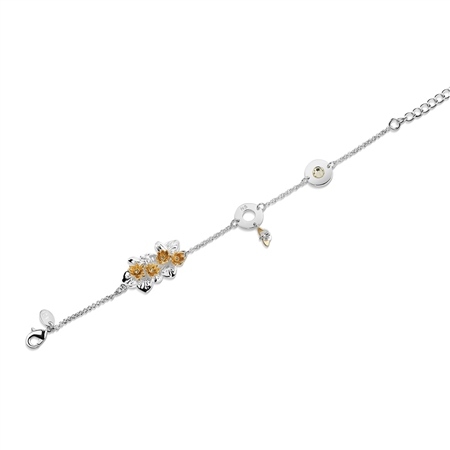 This elegant bracelet captures the beauty of the Lilypad that floats on the waters surface. Wear it every day as a stylish reminder of your unique sense of style making it the perfect accompaniment for every occasion. Silver and gold plated Lilypad bracelet with a protective anti tarnish layer, 5 yellow topaz coloured crystal stone settings, Lilypad flower and butterfly detail, presented in a Newbridge Silverware gift box. Product dimensions 190mm x 50mm(Lilypad).